[A]Ⓡ works with complex institutions which handle hundreds of thousands or millions of content IDs, across multiple content types, regions, product teams, segments, and departments. [A] clients include many of the largest enterprises in the world within their categories. Each month, [A] manages digital properties that serve millions of users across many millions of sessions per month. Many of [A]’s clients have decades of expertise and leadership in their space, which comes with many decades-worth of content needing to be adequately organized, mined, and purposed for emerging channels and distribution scenarios, crafting new, personlized customer experiences. Together we build lasting strategic partnerships that drive low-effort customer experiences, better returns on content assets, streamlined processes, far more efficient use of author and subject matter expert time, lifetime digital excellence, marketing innovation, and massive competitive advantage. Almost always [A] works under NDA. Often [A] handles highly-secured, regulated financial or medical data. Sometimes [A] works invisibly alongside agencies. Always [A] delivers consistent quality and specialized expertise. [A]Ⓡ periodically publishes project profiles highlighting the approach and outcomes of a few of our key client engagements. Current available profiles focus on Association and Healthcare successes. 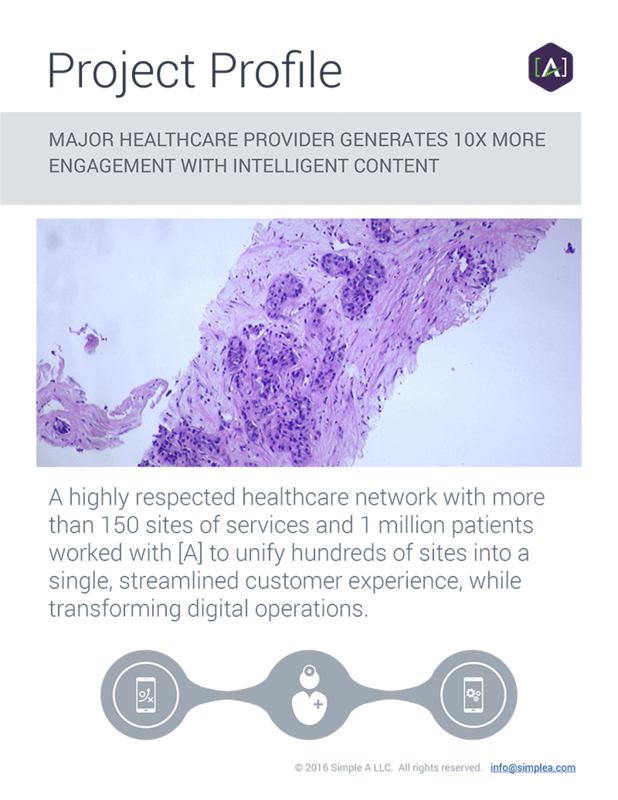 Read how a highly-respected healthcare network with more than 150 sites of services and 1 million patients worked with [A] to unify hundreds of sites into a single, streamlined customer experience, while transforming digital operations. 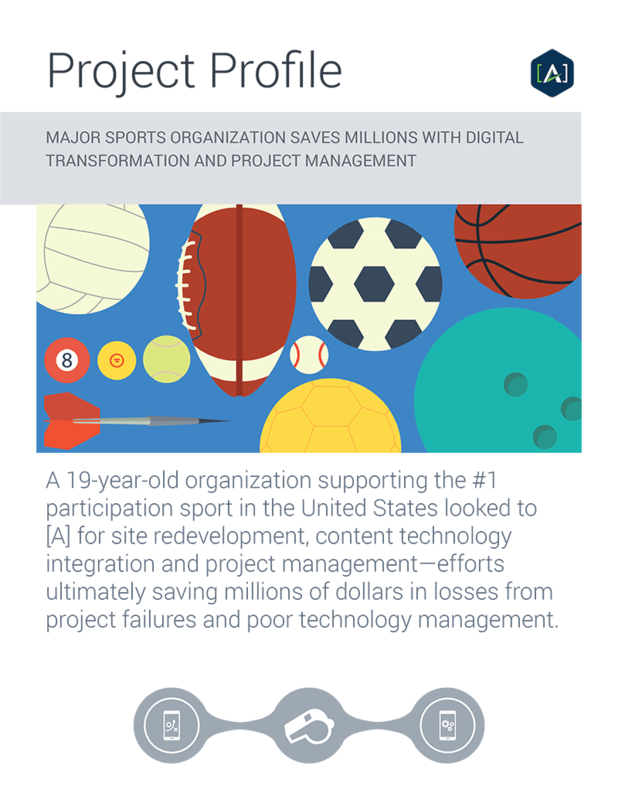 Read how a 19-year-old organization supporting the #1 participation sport in the United States looked to [A] for site redevelopment, content technology integration and project management— efforts ultimately saving millions of dollars in losses from project failures and poor technology management. To respect client privacy, [A] does not publish client lists or named case studies. Download key project profiles here. Named references, cases, and examples are available with NDA. To engage, contact [A]. National association clients [A] serves include trade groups, sporting governing bodies, advocacy groups, accrediting bodies, and educational entities. Learn more about digital strategies, tools and support for Association marketing initiatives here. [A] works with several large healthcare institutions providing health care and support to hundreds of thousands patients on state, national and international levels, and representing thousands of doctors and care providers as well. Work in the space includes handling PHI as a HIPAA Business Associate. [A] serves national non-profit organizations, often dedicated to major societal social causes or issues advocacy, that require structured content to orchestrate personalized experiences for donors, volunteers, board members, government, media, and other stakeholders to achieve social and community goals. [A] partners and works with federal, state, county, and city level government entities including federal agencies, a presidential library, state agencies, county and local government services, and public utilities. [A] works on a local and national level with providers of consumer financial services and sponsors of private investment funds. Structured content facilitates the sale of financial services and instruments, and allows for seamless management of money and secure information across desktop and mobile applications. [A] serves public and private universities and institutions of public learning. [A] has worked at the university-wide level, and also for a highly-ranked business school. Also, [A] has worked for State-level private-public education partnerships and for educational advocacy groups, a teacher’s association, and a public library. [A] has worked both nationally and internationally with publishing companies to help better structure content, understand content assets, structuring editorial process for content intelligence and return on investment, and working on strategy engagement to provide a higher value return on content assets. [A] works with government and educational scientific institutions to more efficiently mine and reuse their data-rich content, including a federal science agency and one of the world’s largest international science education associations. [A] has worked with oil companies, gasoline retailers, a public utility commission, an electric cooperative, a water rights marketplace, and others involved in the production, transmission, and resale of energy in various forms. Structured content is key to global marketing efforts localized across potentially dozens, or even hundreds, of local and partner channels. [A] has worked both as a strategic provider and integrator working across multinational marketing efforts, where structured content plays an urgent role in executing corporate go-to-market strategy. [A] has played a strategic and advisory role working across a number of other industries, including software, pharmaceutical, entertainment, travel, and business-to-consumer properties. 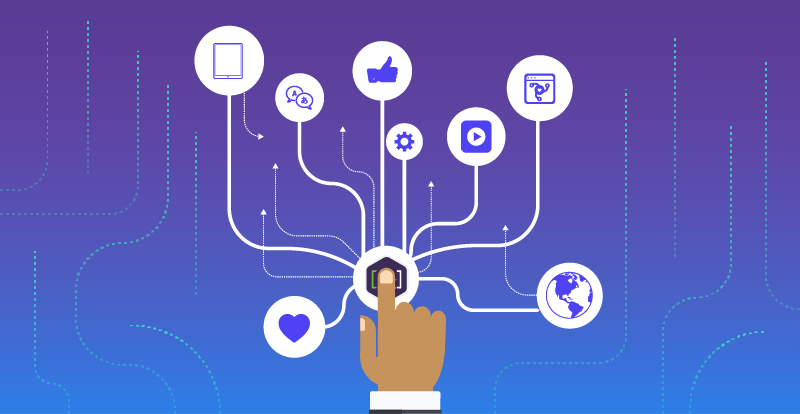 These engagements have centered around digital strategy, content engineering, and omnichannel content asset reuse.